Yesterday I was out in the garden hacking things into shape while the raspberries sprounted a previously unknown pest (some sort of tiny beetle, which combines with rainwater to create mush and mould) and the slugs savaged the blueberries (still got a little bowl of blueberry goodness!) and the Passion Vine (doing very well in this tropical weather) attempted to engulf me whenever I brushed against it. The vegetable kingdom is a savage place, sometimes. Friday's question is about that, and is a for-fun question - how do you relate to vegetables? As ever, go to comments with philosophical arguments with the poll, discussions of gardens of your past and future, amusing stories about vegetables, amusing pictures of vegetables and anything else that sparks your fancy. Like a stupid Facebook game, but you get tasty treats a the end! My most exotic garden wildlife is Goldfinches and Blackcaps! We also have Housemartins in the eves. More prosaically I run a fairly high population of pests, too, including the quite large, furry ones. In some ways I regard pests as semi wild pets that forage for their own food. 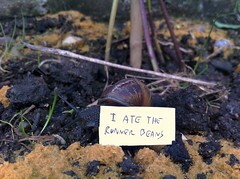 Mammals and birds are cuter but I have no problems with slugs and snails. We get our food from supermarkets and if the slimy creatures need to eat our dahlias at least they attract birds and possibly hedgehogs. My issue is with strangling plants. Brambles particularly (I have a zero tolerance policy) but also ground elder, ivy, bindweed and laurel. I think a spider large enough to take out rats might cause me problems if I blundered into its web first thing (as I often do). My most exotic wildlife is the ring-necked parakeet. This year the slugs and snails ate every legume, so we're sticking to woody climbers and hollyhocks. I also tried deporting them to other streets. Not very successful. I got broad beans past the slugs. They are tougher. Plant early and space them out among the hollyhocks. I have foxes, wood pigeons, angry fighting cats and (almost certainly) rats. No squirrels (yet) which seems odd as they are quite pesty. Exotic veg (when in season)was served to me as a child as a supper snack to keep me going between getting home from school and dinner when dad got in. Of course, I would get crisps often as not, or seedless grapes, but rare artichokes instead were a special treat. I still buy artichokes as a sporadic treat now (though they are slow food so a sign that I'm not rushed or busy - which isn't often.) I like eating radishes like sweets and longon are tasty but fiddly. I just googled longan. Assuming they're tastier than lychees! I have spotted durian in London Chinatown, and Wing Yip claims to get them in the summer season. One day I'll buy one (they are sort of horrible AND moreish) but it would involve a very unpopular tube ride home! All of these fruits are presumably available daily on the Cowley Road - knock yourself out! HMF. When I tried to buy Tejacotes they were nowhere to be found and certainly not on Cowley Road. Wow! They look pretty specialist, I've no idea where one could source such a thing. Did you ever find any in the end? As a last resort maybe see if Kew has a tree and go and steal some! That hadn't occurred to me! No, I never did track them down. There are some new Portuguese delis in town since then so I may make my Ponche yet. Sadly I live in a second-floor flat and have no garden (at least, there is a garden, kept under control by gardeners, and I'm allowed to sit/play in it but not grow things). I have window boxes with rather neglected pansies, petunias and sweet William (I'm out of practice at hot summers and performed insufficient watering). I also have a Belfast sink growing chives, parsley, mint and sage, and failing utterly to grow coriander. The clematis I thought was perennial has decided to have a year off. Or died. The garden wildlife is limited to foxes, cats, squirrels, pigeons, rooks, parakeets and the very-occasional woodpecker. Oh, and sometimes a jay. And children. "You can plant it at any time of year and it just sprouts" -- YES Alys. Not for me it doesn't. Clematis needs a deep pot and some damp in it. It won't do warm and shallow. Fragrant Oberon's good for a pot. Pretty good gardening for no garden! For question one, it was never suggested / hinted to me as a child that I was allowed not to like / eat things and I honestly don't think it ever occurred to me to not like / eat things - although as I have said before my parents / aunts and uncles were very much of the 'I haven't tried it because I don't like it' persuasion (there was a secondary danger that if I asked for something because it was advertised it would then get on 'the list' and we would have it weekly ever after). Possibly. I do remember going off bananas - bizarrely because of a dock strike which lead to them being thrown overboard, the image revolted me for some reason (I have always had a visceral dislike of death and decay), could have been 1972? But I guess fruit is more optional 'cos you choose from the bowl (and I would always eat it in fruit salads). Things I grow at the moment. Herbs on the windowsill. Some straggly mixed leaves. A dragon plant (Bernard) and a peace Lily. Bernard arrived in my life as a scrawny punkish thing in 2008 and has since grown somewhat. He probably needs repotting again but I fear a) this is now a two person job and b) that it'll only encourage him. Since I only have a garden in my imagination having a kindly tiger/leopard/panther visit is entirely possible. I became vegetarian at the age of 13 and I think I probably ate most of what was put in front of me as a kid. My dad doesn't like spinach so we didn't get that - ditto pumpkin which my mum doesn't like. The very pinacle (or perhaps root) of vegetable delight when I was a kid though was the roast parsnip. For reasons of fashion or parental dislikage I ate my first roast parsnip at age sixteen. A revelation. Go on, repot Bernard. Don't fear the dragon! I always liked fruit, and maybe only some veg not all. Sweetcorn always yes, fried spring cabbage also, salad yes and tomatoes in particular, but courgettes were a bye-word for evil in our house when I was growing up. Likewise cooked carrots though slightly less so. We had neighbours that always brought round bags of overgrown courgettes -- we used to call them Courges, though I guess they were essentially Marrows? They were vile, bland, flavourless monsters. We tried eating them, and then feeding them to the chickens (they were not impressed) and then cooking them and seasoning them and feeding them to the chickens (ditto). The peacocks had a peck at them but frankly they were a bit of a fail all round.